Second Addition to the Winter Warmer Series. 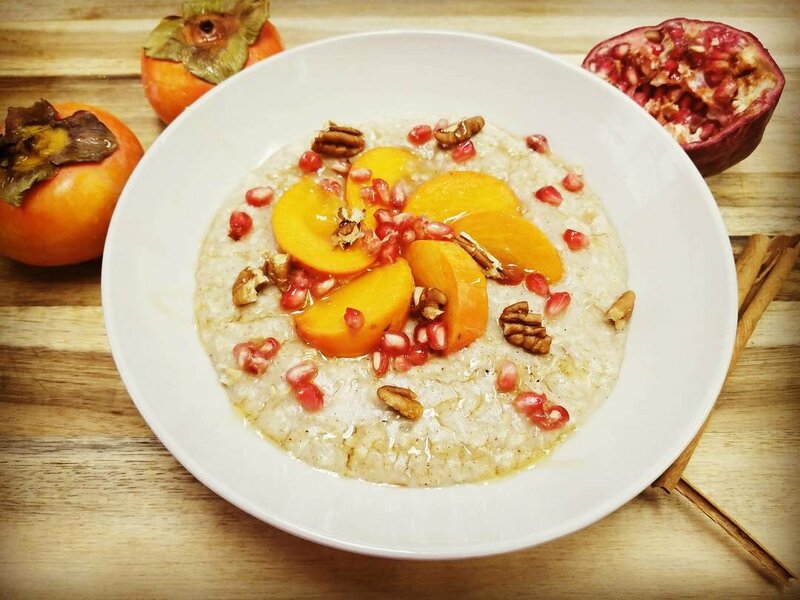 Winter Spiced Porridge with Persimmon and Pommegrante. Everyone knows my love of all things breakfast…. And Sunday mornings… and things that are sweet. And here we have a combination of everything. On top of it being a pretty little dish, (you know part of me is tempted to make this my Christmas breakfast this year) it’s beautifully seasonal … I love all things Christmas especially the scents and flavours, or the spices I associate with this time of year. Cinnamon and Nutmeg are a combination of heaven and I have to admit lately my go to spice for bakes is actually Cardamom. And this lovely little number incorporated everything into one sweet spiced bowl of joy. The colours here make me smile. I love the Orange and reds of this time of year. The Orange Persimmon spiked with the gentle little jewels of the pommegrante… yes. 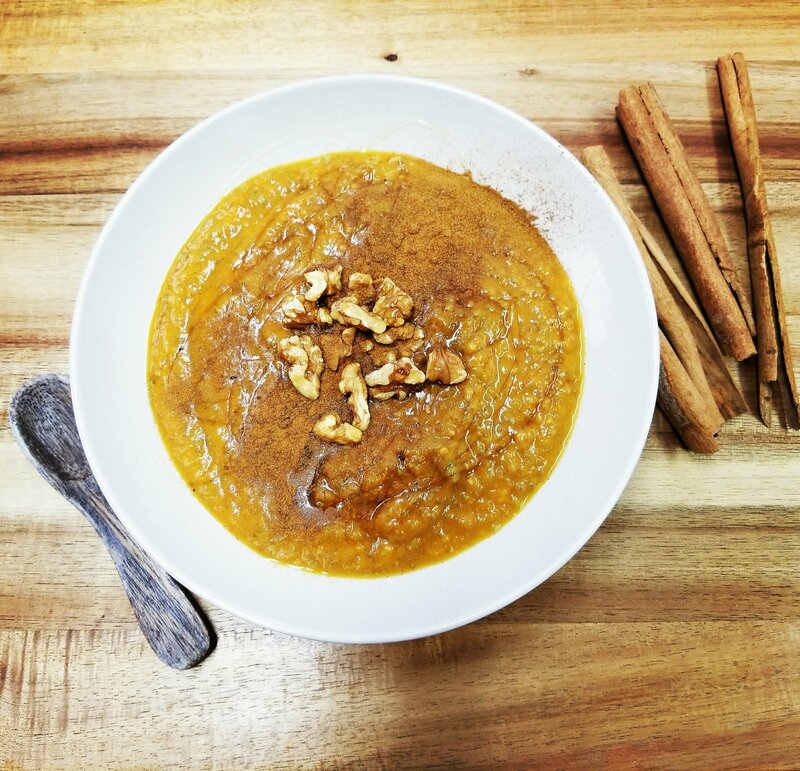 I’m falling in love with food again… back to my point, a more traditional flavour combination at this time is orange and cranberry, I think they would pair really well with this spiced porridge too. Though I do have a love hate relationship with Cranberries, I might have to test that option out just to satisfy my own curiosity at some point. But for now. This one ticks all the boxes. And I have it on good authority that it tastes better taken back to bed and enjoyed snuggled up… Just an idea. So pretty. So easy. So delicious. This recipe serves two but can be halved or multiplied easily. I’ve not really given good measurements for the spices as it’s down to personal preference.. but cinnamon I put in the most of, then just a little of the nutmeg and cardamom as they pack a good punch. 2 Tsp something sweet. And more to drizzle over. Pop the milk in a medium sauce pan and heat gently. Once hot stir through the oats, the honey or maple, and the spices and vanilla. Don’t let this mixture boil just let it thicken gently until it’s the consistency you like. Then take it off the heat while you prep the fruit. Top however you like, make it pretty. You do eat with your eyes after all… And enjoy. 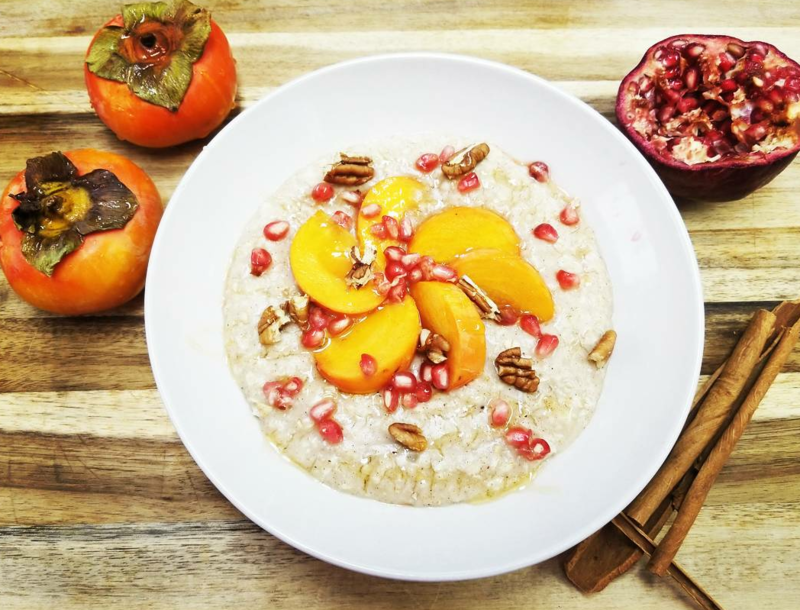 I love a warm snuggly breakfast when it’s dark or cold outside… An overcast morning calls for something comforting and delicious to set you up for the day. It’s just necessary in my opinion, and my sweet tooth is no secret.. so this one just hits the spot. Everyone now knows my love of chia seeds and breakfast prep (it’s the lazy foodies guide to survival.) But this one takes it to a new level, warming the pudding through. For a grain free dish this really feels every bit as filling and satisfying, give it a go! Mind, on another point, I also love how autumnal this recipe is. Actual Pumpkin and Pumpkin Spice? I mean I’m a millenial, come on, sign me up! The scent is just heavenly. Makes me happy.. 😊 Pumpkin everything, is literally the only sign of Autumn that exists in Florida. Well. 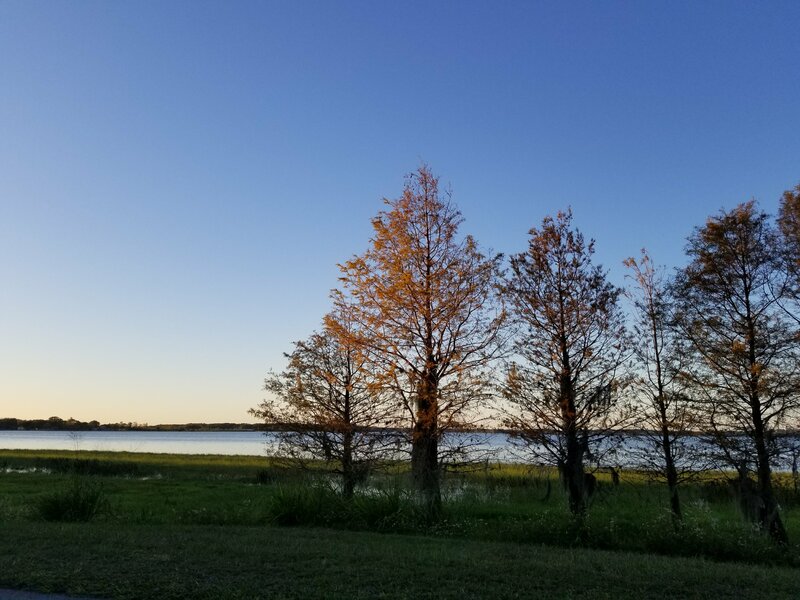 That and the Cypress trees..
Love them. My favourite trail. Back to food though… because this girl thinks with her stomach. This recipe serves one but can be easily multiplied. If you want to add a little more pumpkin spice feel free use this as a blueprint and play! The next morning put the chia seed pudding into a saucepan and stir in everything else , and an extra splash of milk of necessary. Heat on low, gently whisking everything together. Top as you like with sprinkles of extra spices, nuts etc and serve warm. Late Breakfasts are my favorite kind of meal. 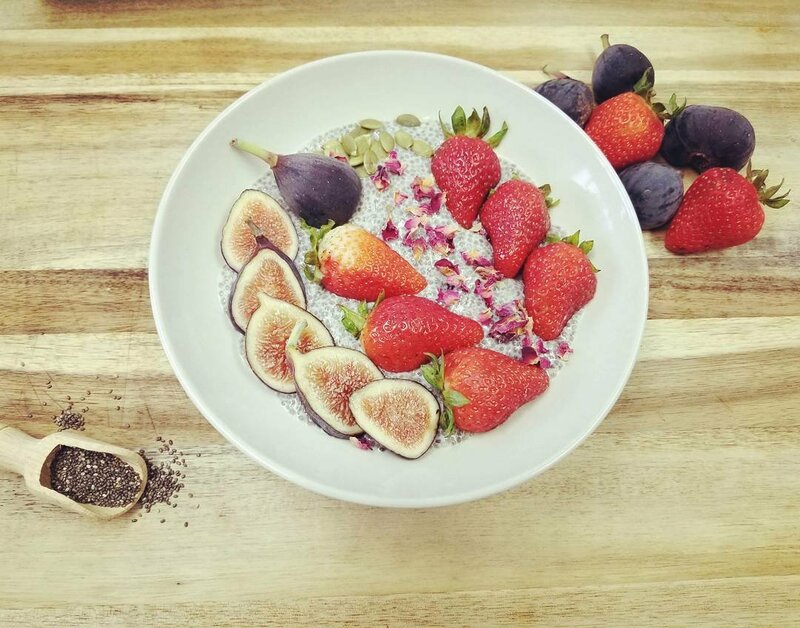 Fig and Rose Chia Seed Pudding. There’s no denying the love I have for my bed. And I love love love a late lie in. It’s always amazing when I get a mid week day minus an alarm clock, and today was one of those days. Hallelujah – literally no idea if that is spelled correctly. Sorry. I digress. In preparation for optimising said lie in I prep breakfast the night before… you can tell I’ve really thought this through can’t you? I do love breakfast being ready for me when I wake, Chia Seed Puddings and Overnight Oats have been a game changer for this. And it couldn’t be easier to be honest… and you feel pretty smug the next day when the prep is all done..or maybe that’s just me. What you’ve got here is a basic blue print for a pudding. Play around with flavour options… I love Vanilla and fresh berries. Carob and Orange works great too. Mix it up. 1/4 Tsp of Vanilla paste. 1tsp of something sweet. Maple, honey, agave. Pop all of the pudding ingredients into a jar and give a really good shake. Leave this in the fridge over night or for at least a few hours. If it’s a little thick the next day just drizzle some more milk in! Next morning – whilst still half asleep- that’s an essential part of the recipe don’t skip it. Top with lots of ripe fresh figs. Strawberries work great too and some dried rose rose petals always look beautiful. Sunday mornings call for lazy breakfasts. 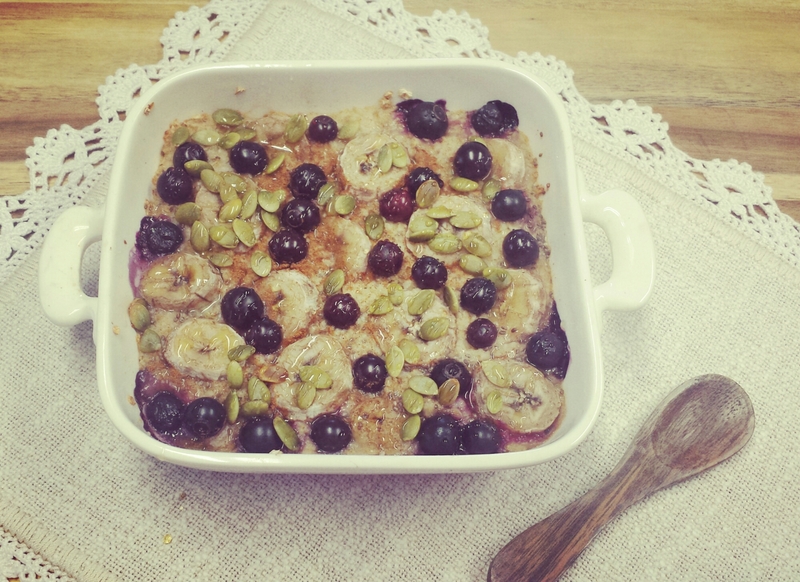 Cinnamon Maple Baked Chia Oats with blueberry and Banana. So I’ve made hundreds of flavor combinations of this in recent years. It’s a quick and easy get ahead for the night before or you can prep it the same morning and them gently cook together in the oven. It couldn’t be any more simple. This is one of my favorite combinations, but try it with literally any berry, stone fruits, even carob or chocolate chips in. Nuts and seeds make a great topping too. Oats are just such a great start to the day. A slow release energy, with a warming and grounding feel to them. You all know my love or porridge. Well this is a little different, but runs on the same principle. I add Chia as a another little hit of goodness, and a fat. But you can add or remove anything you want. Really versatile concept. I love that comfort food, homey feel you get from oats. This recipe is for one, but can easily be multiplied for whoever you’re feeding! Pop your oats into an oven sage baking dish, stir in the chia then add the water and a good splash of milk. Stir everything together and drizzle with maple and a sprinkle of cinnamon. Flatten eveything out to nice even layer and adorn with your fruit of choice. Being sure to poke pieces into the oats as well as just decorating on top. Then either pop this in the fridge over night or straight into the oven! Pop the oven on 375. Give the oats a final sprinkle with some nuts and seeds and bake for 20-25 minutes. A little less if you boiled the water and are cooking straight away!